Wooden Hot Tubs - All Your Questions Answered! 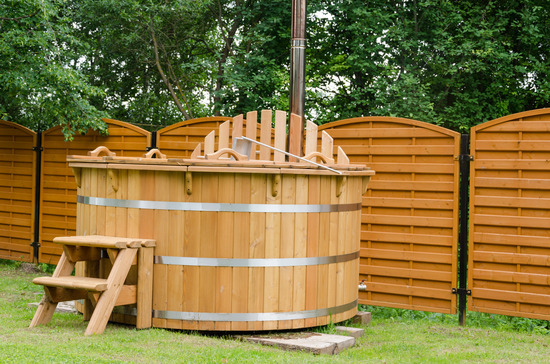 What do I Need to Know About Wooden Hot Tubs? What Type of Cleaning is Involved with Hot Tubs? How Long can I Expect My Wooden Hot Tub to Last? How Much Will I Pay for a Hot Tub? Are Wooden Hot Tubs any Good? It happens to everybody at one point or another. You book a high-end hotel room for the weekend, or you’re invited to a party at a friend’s home. Maybe you splurge on a luxury resort getaway or a week-long cruise to the Caribbean. Along with all the many options, activities and amenities available, you notice there’s one of those glorious wooden hot tubs. If you’ve never had the opportunity to enjoy a hot tub before, you’ll probably be a bit leery at first with all the common questions plaguing your thoughts. Exactly how hot is it? Is it really safe? How often is it cleaned? Just who was in there before me? What might be lurking therein? Still, the hot tub calls to you in an inaudible voice far more powerful than any logic or reason. You’ll ultimately give in: it’s inevitable. It doesn’t mean you’re weak. It just means you’re human. In a Hurry? Check Out a Well-Priced Cypress Hot Tub Here! Once the temptation takes over, you’ll climb hesitantly into the sultry liquid and assume the standard guarded pose: back straight, arms in, legs firm and feet steeled against the bench. Then, something mystical takes place. Before you have a chance to fully comprehend what’s happening, all the purposeful tension melts away. The water wraps you in a steamy, comforting embrace, causing your body to automatically slither chin-deep into your boiling surroundings. You’re stopped only by the outstretched feet of your partner, friends or five complete strangers. At this point, there’s only one question left on your mind. Incidentally, the answer is yes. Bottles, wine glasses and even Solo cups do, in fact, float as long as they’re not filled to the rim. By the time you’re forced to grudgingly drag your fully relaxed, Jell-O-like body out of that temporary tropical oasis, you’ve contracted the infamous I-want-one syndrome. Of course, you’ve only experienced one side of the equation. This particular hot tub is maintained by an outside party for your therapeutic pleasure. That’s not to say you shouldn’t buy one for yourself because you should. It’s just important to weigh your alternatives first. In all likelihood, the spa to recently steal your heart was probably an acrylic model. Essentially, it’s a bathtub equipped with jets and a heater. While there’s nothing inherently wrong with this material, you do have other options. Long before acrylic ever made its grand entrance into the market, hot tubs were made of wood. This began centuries ago in other parts of the world, but they’ve only been on the U.S. circuit for a few decades. Before heading over to your local hot tub dealer, consider a few points. Hot tubs made of synthetic materials offer a sophisticated and even space-age appearance in some cases. Wood has a classic, more down-to-earth appeal. Do you prefer slipping away to an ultra-modern condo on the beach or escaping to a rustic cabin hidden deep in the mountains? Would you rather cruise around town in a brand new Camaro or a 1968 Aston Martin? This particular element is nothing more than a matter of personal style, but it’s only the tip of the iceberg. Regardless of the type of material you choose, labor and prep work are going to be involved. Spas are heavy to begin with, and you’ll have to factor in the weight of the water as well. You’ll need either a concrete pad or significant reinforcement for your deck before bringing it in. As far as acrylic spas are concerned, getting them into position is the biggest hurdle you’ll face. The bigger you go the more of a problem this becomes. Wooden hot tubs are assembled on-site rather than being prefabricated, so you don’t have to worry about a flatbed tearing up your lawn during delivery or paying a chiropractor on behalf of all the buddies you asked over to help with the installation process. Acrylic spas have internal plumbing and mechanics. All this is sandwiched between their outer and inner walls safely tucked away from view. At the same time, they’re one solid, fluid piece. Their benches are pre-formed at a specific height, jutting out from the wall of the tub and tapering outward until they become the floor. Once you add all this up, you’re losing a good bit of square footage. Most wood hot tubs, on the other hand, are externally plumbed. Their outer wall and inner wall are one and the same. That wall also happens to be vertical rather than tapered, and it’s usually taller than what you’d have with an acrylic model. Benches are still in play here, but they’re adjustable instead of being fixed in place. All this means wooden hot tubs are deeper and have more interior space than their acrylic counterparts. If you’re hoping to accommodate a maximum of four people, you could do so with a smaller wood hot tub than an acrylic one. Of course, you could get a wooden spa occupying the same amount of space as a four-person acrylic and actually invite a couple extra friends over to enjoy it. In spite of any chemicals you may use to keep your spa sanitary during and between uses, it’s going to need occasional cleaning. For an acrylic model, manufacturers typically recommend completely draining the water approximately once every four months and applying a mild detergent to its inner shell. Let the cleaner sit for a bit, wipe the surface clean and rinse well. While the process is much like that of cleaning your bathtub, you do have a number of extra nooks and crannies in need of attention; otherwise, you could have a certain amount of mold and mildew buildup around the jets and other components over time. In the event hard water spots and “ring around the tub” issues arise, an additional cleaner designed specifically for spa shell surfaces is available. Filters should also be removed and cleaned from time to time. Wooden hot tubs also need to be drained and cleaned periodically. Manufacturers of these models state a simple rinse-down with a garden hose is generally enough to remove any potential residue. Though mild detergent or a solution of diluted bleach may be used if needed, experts warn against using abrasives and more harsh varieties of chemical cleansers. High quality spas are built with durability in mind. Manufacturers realize when customers are making an investment like this, they expect to get the most out of their money. They’re also fully aware of their warranties and any financial obligations those entail should their products not live up to advertising claims. Acrylic is a long-lasting synthetic material designed to withstand years of repetitive use. That being said, if you’ve ever seen an acrylic bathtub after ten years of wear and tear, you probably know where this is going. You’ll notice tiny cracks beginning to appear. Inner surfaces eventually start holding onto stains more so than they did initially, and they’ll ultimately blister and peel. Depending on the design of the acrylic spa, its inner lining will either need to be replaced or resurfaced. Most of your higher-end wooden spas or wooden hot tubs are constructed of cedar, which is one of the longest lasting species on Earth. Consider the age-old tradition of the cedar hope chest built at the time of a daughter’s birth and passed down through generation after generation. Cedar naturally produces oils to help resist the elements, making it perfect for prolonged exposure to water. Designers note by keeping a cedar hot tub covered and perhaps applying an extra yearly coating of some type of high-quality protectant, these versions can last for decades. Cypress and fir wooden hot tubs models are available as well. Like cedar, cypress generates its own oils, making it resistant to moisture and decay. It’s a popular, long-lasting material for siding and roofing. Fir, specifically the Douglas variety, is likewise able to withstand heat and moisture without warping or cracking. It’s widely used in sauna construction. Both have also been known to last a few lifetimes with proper care. With all the different brands, styles and models available, creating a comprehensive, all-inclusive price list would be virtually impossible. For this particular question, the comparison will be a general one between portable options. Keep in mind, extra features and accessories will drive up your price. Portable acrylic spas will cost you between $1,000 and $10,000 or more. Where the more pricey models are concerned, you’re basically paying for size and technology. Wooden spas, on the other hand, generally range from $1,200 to $7,000. They tend to lack the most recent bells and whistles, such as mobile device connectivity, underwater LED lighting and built-in audio-visual equipment with surround sound. As mentioned, wooden hot tubs aren’t usually equipped with the same digital features as their acrylic cousins. From a different angle, those technologically advanced models offering off-site control options and all those extras making them comparable to an RV are typically purchased for commercial applications. First-time buyers have a tendency to start off with more basic versions just to test the waters, so to speak. While you can certainly purchase wooden hot tubs with in-depth pump and filtration systems, or buy them as additional accessories, they’re really not necessary with a wooden hot tub simply because of physics. Hot water rises, naturally pushing cooler water to the bottom of the tub where it’s drawn into the heating system. The water essentially circulates itself; not to mention, fewer components means less maintenance. Most hot tub owners consider the less involved cleaning efforts required for wooden hot tubs a very definite advantage. No matter the type of spa you choose, you’re going to need to exercise caution when adding chemical treatments. The right balance of chemical versus water volume is crucial to maintaining sanitation and keeping your family and guests from smelling like chlorine or bromine for days after enjoying the benefits of your hot tub. For wooden models, taking care to not overuse chemicals is also a factor in just how long your spa will last. Those necessary water treatments could counteract the natural oils in the wood just as they could eat away at an acrylic surface. Over time, using chemicals without due attention to moderation may cause a wooden model to leak or crack. All this being said, you probably still have a couple common questions floating to the forefront of your mind. The answers to those are relatively straightforward. First of all, wooden hot tubs aren’t as prone to leaking as most consumers would believe. Manufacturers design each piece of wood to interlock tightly and perfectly with the next in line. Although some owners notice a few small drips or drizzles for the first day or so after assembly, wood, by its very nature, swells slightly when wet. Those slight leaks, on the rare occasion when they do occur, quickly correct themselves. Secondly, and this is certainly a very common concern, splinters really aren’t an issue. Whether you opt for wood or acrylic, you’ve got an endless array of models available. Wood is increasingly popular among hot tub shoppers because those falling into this category are efficient, serve their purpose well and are an exceptional value for their price. A couple different manufacturers currently outshine the rest where quality is concerned, and three specific models have emerged as crowd favorites. Stained with a redwood tub finish, this model is composed of solid cypress, which is naturally capable of withstanding sauna-style constant moisture and high temperatures. It’s said to go from boxed to built in about half an hour, which means you could put it together after work on Friday and be soaking by Saturday evening. Measuring 64.5 inches in interior diameter, it holds 280 gallons of water. Between the diameter, depth and the 127 jets with which it’s equipped driven by a 1 horsepower Turbowave Blower, the Spa-N-A-Box provides its occupants a full-body massage. It’s capable of heating up to 104 degrees, the maximum recommended temperature for a hot tub, but you can adjust it lower to meet your own preferences. This is an electric model operating on a standard 110V circuit, so you won’t have to have any special wiring installed to enjoy its stress relieving benefits. Oceantis includes an inflatable cover with purchase to keep out debris as well as a thermal cover for those times when you want to lock in the heat. Hard covers are available at an additional cost. Since it’s fully portable and designed for fast, easy setup, you could potentially assemble it outside during the warmer months, and then move it into your basement, garage or other indoor area for winter. Manufactured by Northern Lights Cedar Tubs, this electric model features a 5.5 kilowatt heater and a digital controller. Its 8 maneuverable jets are powered by a 2 horsepower, 2 speed pump providing gentle but effective kneading for those achy muscles and joints. Six adults can fit comfortably on this model’s adjustable bench and stretch out in its 5.5 feet diameter, 4 feet depth. A chemical treatment starter kit is included with purchase, and this particular option is equipped with internal lighting for those nighttime soaks. Installation is rated in the “easy” category. This cedar hot tub model comes with an insulated locking cover to keep the heat in and the little ones out until adult supervision is nearby. Measuring 6 feet, 2 inches in diameter, this offering from NLCT is fueled by either natural gas or propane. If you don’t already have a fuel connection near your planned setup point, you’ll need to have one professionally installed. It does come with a Pentair MasterTemp 125,000 BTU gas or propane heater. Many home and spa owners swear by gas power for its ability to better maintain constant water temperature, so this may be the way to go if you plan to use your cedar tub outdoors during cooler weather. Also classified as easy to install, the propane or natural gas eight person model includes many of the same features as its electric six person counterpart, such as adjustable seating, jet massage action, extra pump and filtration systems for optimum water purity and circulation and the standard internal lighting as well as a chemical treatment starter package. An insulated locking cover is likewise provided with purchase. model comes in at $1,249, well within the lower price range. Still, its features render it a great value for its asking price. is the most expensive of the three at a little over $8,000, but it seats more people and, again, the extra features are there. In a nutshell, consider your budget and the features important to you. Each of these models offer all the therapeutic enjoyment for which spas are famous while incorporating the enduring nature of hardwood and none of the technological frills known for needing repetitive maintenance and upgrades.